The King of Spring has returned to reclaim his place on the throne, it's turkey hunting time y'all! 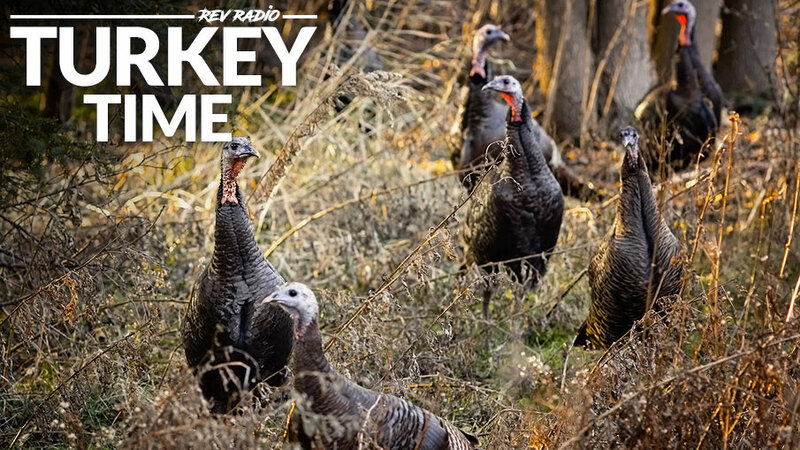 This week on The Revolution, it's exclusive turkey hunting talk with our panel of pros. Get the dish on early spring tactics, calling, gear and more. Joining us will be Travis “T-Bone” Turner from Michael Waddell’s Bone Collector and Nate Hosie, co-host of HeadHunters TV on Outdoor Channel. Plus, Nate Metcalf with MOJO TV on Sportsman Channel and Tony Peterson from Bowhunter Magazine. The Revolution and this week’s “Turkey Time” is presented by Outdoor Channel, Sportsman Channel, World Fishing Network and MyOutdoorTV. When it comes to turkey hunting, there are arguably no bigger cheerleaders for this spring pastime than the men of Michael Waddell’s Bone Collector with their #CantStopTheFlop campaign. This week on The Revolution, Travis “T-Bone” Turner joins us to talk turkey in a special two-part interview. Travis is known for his archery prowess and tells Jim and Trav that he has taken gobblers with a bow. However, his method differs from many in that he does not shoot for the body, but rather the head. Travis says that turkeys make for a difficult target as they are constantly moving and don’t have a very visible aim point because of the very three-dimensional nature of their bodies. Instead, he aims for the head using large cutting mechanical broadheads. With this method, Travis says you now have a very clear aim point with the red head and you will either make a clean kill or a clean miss, with a smaller chance of wounding the bird. While he is a prolific bowhunter, Travis says he prefers to turkey hunt with a shotgun. He’ll talk about the importance of spending some time with your shotgun, before the season, patterning at different yardages and seeing what shot and chokes it performs best with. Travis will also discuss his tactics for enticing a tom that is hung up out of range. In addition to using more aggressive calls, he’ll explain how to use your decoys to your advantage. In the second half of our discussion with Travis “T-Bone” Turner, he’ll talk hunter recruitment. Spring is a great time of year to introduce new people to the outdoor lifestyle with not only turkey hunting but, very simply, just getting them into the woods and fields and sparking their interest in the outdoors. Travis says that sometimes it seems as though, we as hunters, have lost sight of what is important. It’s not the size of an animal or how many tags you’ve filled, but rather coming together and celebrating each other in our successes and our shared passion. He notes that over the last several years, nearly 2.2 million hunters and license sales have been lost, which can have a dramatic impact on conservation efforts. With hunter recruitment on the forefront of their minds, Travis says that the Bone Collectors are putting a special emphasis on getting more people into the outdoors, bolstering hunter numbers and celebrating this way of life. You can watch Travis on Michael Waddell’s Bone Collector on Outdoor Channel and catch previous seasons on the MyOutdoorTV app. Catch this great interview this week on The Revolution! Hunting pressured turkeys can be challenging and frustrating but Nate Hosie, co-host of HeadHunters TV on Outdoor Channel, says realism can turn your hunt around. This week on The Revolution, Nate joins Jim and Trav to hand out some tactics for hunting educated birds. Nate tells Jim and Trav that it’s all about realism – from your calling to your decoys to your setup and woodsmanship – elements of realism can help fool even the wariest of birds. Nate will discuss calling specifically and explain how to add realism to your calls with the addition of hesitations and uneven cadences to create the most realistic scenario possible. Competition calling and calling in the field are very different. Nate tells Jim and Trav that there are a lot of incredible callers out there that you can certainly learn from, however, he says if you want to improve your style, sound and technique, Mother Nature is the best teacher. He encourages hunters to watch hens, pay attention to their cadence, their tone, their yelps, their behavior and how they react when a tom is coming in. Being able to read the turkeys and use that information to your advantage is a priceless tool. Turkey reaping or fanning is not a new concept – using a decoy or a fan to crawl within shooting distance of a gobbler has been proven to be very effective for turkey hunters. Tune in as Nate Metcalf with MOJO Outdoors and MOJO TV on Sportsman Channel, joins The Revolution to discuss this technique. Nate will talk about the MOJO Scoot-N Shoot Decoy and the incredible field footage of hunters using it. He tells Jim and Trav that hunters can get ridiculously close using the Scoot-N Shoot decoy as a cover to hide their faces and bodies. Once hunters crawl within range, turkeys can often become very territorial and aggressive, and in many cases charge the decoy, giving hunters an incredibly close shot. Nate will also talk about the MOJO Tail Chaser Max, another great tool that, in this case, attaches to your shotgun barrel making this more of a hands free decoy/fan. For any hunter who has experienced a turkey hanging up just out of range, Nate will talk about how this method can be helpful in bringing in reluctant turkeys. Tune in for an exciting look at turkey reaping and how to use this technique to elevate your spring turkey hunting game. Are you an archery hunter? If so, you know that hunting turkeys with a bow is a challenge! Tony Peterson with Bowhunter Magazine joins The Revolution this week to talk about a recent article he wrote to help hunters identify the mistakes they are making and uncover why they aren’t good at bow hunting for turkeys. Tony will explain why it is important to put your decoys within close proximity of you if you hope to bring turkeys within bow shooting range. When it comes to decoys, Tony says that the layout of the spread needs to be considered as well. An unrealistic or unnatural setup could send birds running in the opposite direction, so he stresses the importance of taking your cues from nature and watching how real birds congregate, travel and react. While it may be tempting to go with inexpensive decoys, Tony tells Jim and Trav that purchasing good realistic decoys can make a big difference in your hunt and ultimately get birds to commit and come all the way in. Finally, he’ll hit on shot placement. In general, archery turkey hunters have a relatively small target to hit, and that vital area is covered in feathers and is constantly moving. Tony says the purchase of a 3-D target and plenty of time slinging arrows before you head afield can help you familiarize yourself with the shot placement and make all the difference in your success.